This review shall not delve into the philosophical questions raised by this movie, because there are none. Mirror Mirror is a modern, old-feminist retelling of the well-known Snow White fairy tale. After losing her mother and father at an early age, Snow grows up in the palace of her step-mother, the ambiguously evil queen (villains don’t need motives in family movies) embodied by Julia Roberts. Snow, having been confined to the palace her whole life, is blind to the reality of the outside world and the poverty which afflicts the kingdom’s commoners, whom the queen liberally taxes to pay for her extravagant parties (it might sound like a conservative movie, but it's not). Upon turning eighteen, Snow decides to escape her isolation and *See The World*. She finds two guys, a prince and his companion, hanging upside down in a snowy forest. After she rescues them, the prince immediately falls for her and Snow seems to return his admiration. Their friendship draws the jealousy of the queen, who commands her servant to execute Snow White. As the old tale goes, the servant spares Snow out of sympathy and our heroine stumbles upon seven dwarves in the woods. The dwarves in this film are certainly oddities. Here they’re depicted as acrobatic bandits who use mechanical leg extensions to look like giants and accomplish their dastardly thefts. These good-for-nothing rogues adopt Snow and train her in the art of Kung Fu, err, swordplay. The story proceeds with the prince embarking to give the pesky dwarves justice for their crimes. Mirror Mirror is a weak movie on the technical side of things. Bad green-screen abounds, the camera work is cliché, and many sets closely resemble those from better movies (Alice in Wonderland) and video games (Myst). The acting is fine, though, and the screenplay conjures a couple laughs. Mirror Mirror is rather similar to another fantasy movie called Ella Enchanted. Both are funny, optimistic movies about “true love” which have well-defined characters and plenty of comic relief to ease our minds when the heroes deal with strife, even though nobody dies or inherits wounds. Neither movie will require thinking or logical analysis to enjoy. 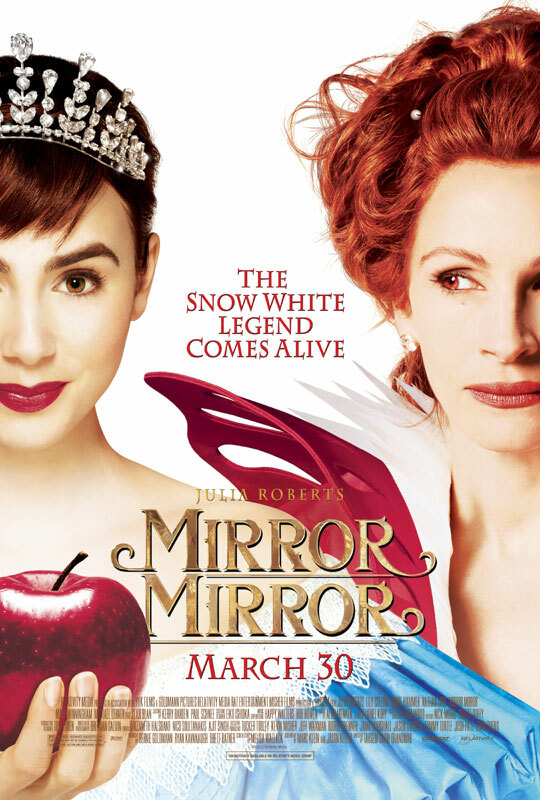 If you want some uplifting, wholesome, happily-ever-after entertainment to watch with your younglings, Mirror Mirror should satiate you. It has clever dialogue, amusing characters, and no bad words except for one abuse of God’s name (not that I count things like that, oh no). Irrelevant observation: Sean Bean has a small role in the movie. I have no idea what he’s doing in here.